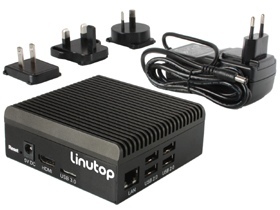 Linutop news : Linutop 6 mini PC is available! Linutop 6 mini PC is available! Perfect for secure Intenet access, digital signage, silent desktop and many other applications. Cost Efficient maintenance free with linutop lock. The new Linutop 6 is powered by Linutop OS 16.04, lightweight and optimized Ubuntu distribution 16.04 LTS including Internet and display kiosks for professional uses.